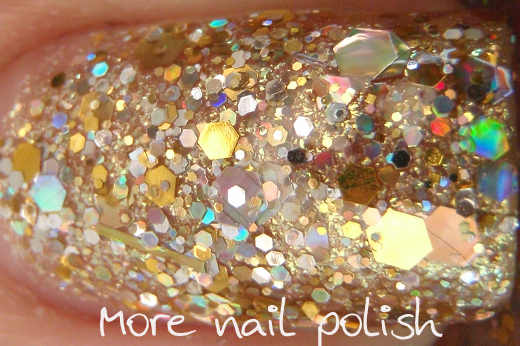 Today I just have my NOTD for you. Actually, this is more like my nail of the last three days, which is really something for a girl who normally changes her polish daily. This golden blinged out layering combo of awesomeness is Crows Toes Maxxed Out. 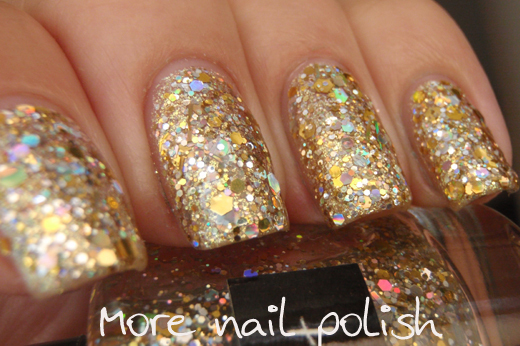 Arrggh - I love gold nail polish so much! 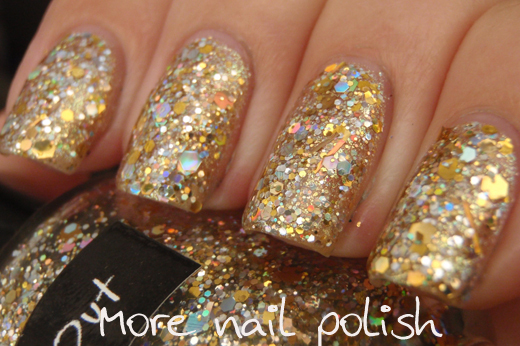 I want to marry this polish and have its babies! This is one dabbed coat of Maxxed Out over the other polish I plan to have babies with - Picture Polish Majesty. While I have been wearing this polish for three days, I've actually been enjoying the start of two weeks holidays off work. I'm not planning to go anywhere, just to spend it at home with the kids. I thought that while I was on leave I would have hours to spend playing with polish, but so far I'm been just having too much fun enjoying being with my family. 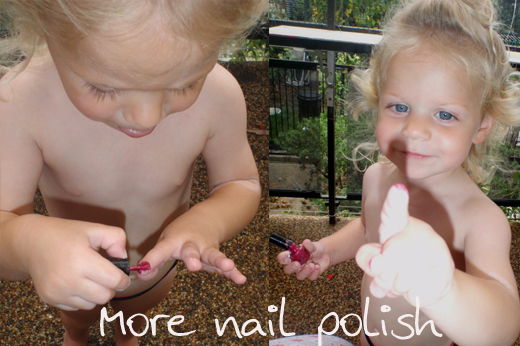 Although playing with the kids doesn't mean there isn't some nail polish involved. Here is Miss Madam Two after pinching an old frankened bottle of polish. She sneaked out into the cat run and started applying her polish. I was closely behind with the camera to see what she was up to, and she was very happy with her handy work. Oh, and apologies for her minimalist approach to clothing here, whist I admit it has been hot lately, Miss Two has developed a fondness of stripping off - totally. I'm lucky that she still had her undies on! Wow! Now that's what I call Bling bling nails! Super blingy! Gorgeous! If you don't me asking, I was curious what kind of camera and macro lens you use? Your pictures are beautiful and very well done. 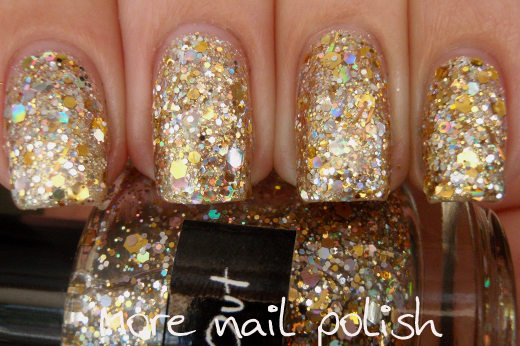 Love gold and love glitter even more. Miss Two is cute, She must be about 2 1/2 years old that is the age my daughter was when she went through her must take all clothes off stage. What's worse is when you send two little 2 year olds to play in their room and they come out five minutes later both in only undies. Oh yeah it is a stage they go through. Just wait someday she'll be clothing obsessed and shopping like a Junior Leaguer. I see she grabbed a classic first color for any girl, a red polish! Haha, this makes me laugh. She only just turned two and few weeks ago, so lets hope this stripping stage doesn't last too long. I'm sure colder weather will put a stop it. I can hardly imagine what she will be like when shes ready to start shopping! Oh this is super pretty. And your little girl cute! 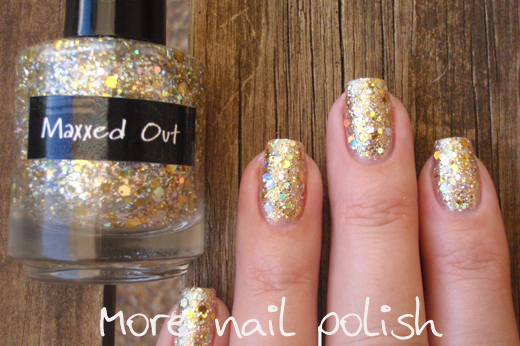 oh goodness, Maxxed Out is divine over that piCture pOlish! Do you know how Maxxed Out compares to Golden Rules? I have Maxxed Out coming up tomorrow! Miss 2 is wonderfully divine. My Miss 4 would LURV playing with her! Wow, it's very beautiful !! Oh that is such a pretty polish! Think I'll be needing that one now ;) And she is the cutest kid!!!!! !